"Have you, or a family member you love, suffered from a lack of meat recently?" "Are you tired of eating salads, fruits, and things that are actually good for you?" "Hi, My name is Johnny and I'm here to tell you about the cause (AND solution) to all of your problems. " The Musket provides a compilation of meats that will make your man parts (or lady parts) quiver. This quaint unassuming restaurant is located on a stretch of the industrial path where no man should be eating. With it's patented menu and tasty offerings, you can kiss those salad days (and small waistlines) goodbye! My time at the Musket involved ordering a meat platter for 2 as well as 2 pork hox, and a rouladen. The best part was ordering all that meat. The worst part was having to share it all. The meat platter for two ($45.95) should really be shared amongst 3-4 people. They must have misprinted on their menu. They probably meant a "Meat platter for Two competitive eaters". Nonetheless, my team of 8 attempted to tackle this feast and the platter served as nothing more than a giant appetizer sampler. 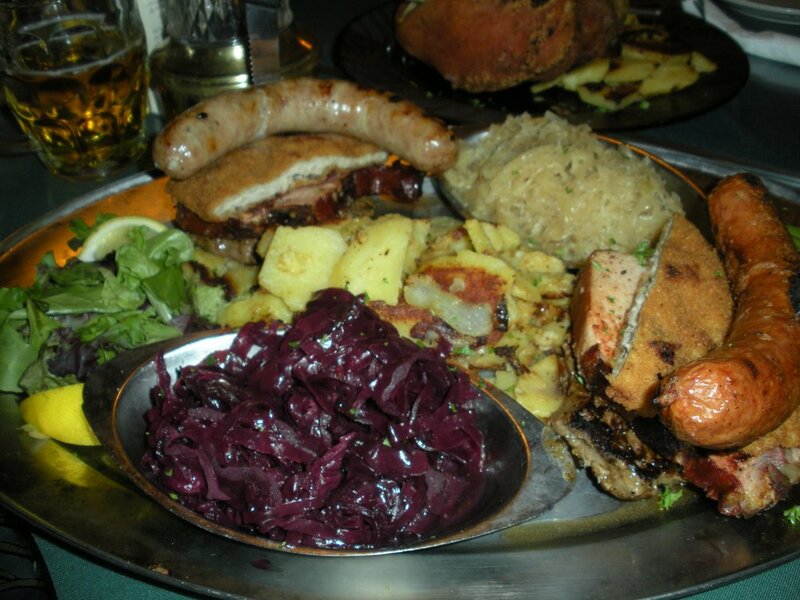 Consisting of weiner schnitzels, steaks, grilled ham steaks, brats, bocks, sauerkraut, and potatoes. I could individually describe each meat, but I will save some time. It was *expletive, expletive, expletive, expletive* good. The schnitzels were tender and breaded nicely, while I found the steak to be extremely tasty despite being a bit overcooked for my taste. The rouladen is bacon, onions, and pickles wrapped in a flank steak with a heaping ladle of gravy poured on top and served with kraut and potatoes. Presentation was nice and it looked a bit intimidating, but I thought the taste wasn't there. The flank steak was overly dry and the fillings were good but a bit sour. I did enjoy the kraut and the potatoes with the gravy though. Onto the pork hox (usually spelled hock in most places)... the best part of the meal. The only issue I had with the pork hox was that I had to share it with others. If any of you reading this were with me that night, just know that I restrained myself mightily from stealing that pork hock and eating it in the corner alone. It is very similar to the Filipino Pork Knuckle. The skin is crispy and is almost always the best part. The main difference here is that the meat was much more tender and pink (as opposed to fried and chunky). The flavor of the pork came through entirely. It's served with dijon mustard and the aroma that wafted into your nostrils with every bite was an incredible ordeal.